You’ve no doubt seen pitching machines on the web and probably tried more than a few. What makes the Hack Attack pitching machine different from the rest? Well it doesn’t look that different in terms of design, but the moment you run it you’ll know why it’s a cut above the rest. In a word, this is a powerful and versatile pitching machine. The Hack Attack Baseball Pitching Machine pitches major league 100+ MPH fastballs, and right and left handed breaking pitches. The unique three-wheel design allows you to see the ball clearly all the way through the feeding motion and release, just like a live pitcher. The 2015 model have a new sleek look and upgraded exterior design plus inside/outside adjustment that provides instant location change. Pitches fastballs, curveballs, sliders and split fingers. Head also pivots in any direction for ground balls, line drives, pop-ups and 380ft fly balls. What are the Main Features of the Hack Attack Pitching Machine? The Hack Attack baseball pitching machine is being hyped as a versatile tool for hitters, and the specs certainly can back this up. Once you’ve got the Hack Attack pitching machine unit ready it can throw a wide array of pitches. It can throw fastballs, curve balls, sliders, breaking pitches and split fingers. You can adjust the settings so it throws left or right handed. Do you know of any other pitching machine that throws different pitches like this one? In addition, the machine can throw up to 100 mph which is great for serious players. It’s capable of hurling head pivots in any direction, exactly what you need for fly balls, pop ups and ground balls. The unit has an added advantage of being portable so you can bring it with you in the car. It’s small enough to pass a doorway. One of the most notable features of the Hack Attack is the three-wheel design, because the ball is visible throughout the process, from the feeding, acceleration and the pitch. With the way the machine’s been designed, you’ll know the release angle and stride, providing a genuine sense of location and timing. How Do You Change The Speed of Pitches? There are dials for changing the speed at which the balls are pitched, and switching from left to right pitching is straightforward. There’s also an elevation adjustment that will lower or raise the pitch. There aren’t a lot of bells and whistles on the Hack Attack and that’s okay, because it’s got the features that do matter. Once you’re done playing you can tilt the unit, set the legs and roll it. The device also has front wheel guards that make certain the throwing wheels don’t touch the ground. The Hack Attack also is compatible with a wide array of regulation baseballs, soft practice balls, Wiffle balls and dimpled practice balls. And yes, the unit does not require any assembly. It comes out of the box ready to use so to speak, so no need to mess around with sockets, wrenches or screws. Are the Pitches Any Good? In a word, yes, the pitching is very good, and so is the overall design. The three-wheeled design makes the machine function like a real pitcher, very important when working on your game. As any hitter will tell you, timing is crucial so having that realistic feel is a bonus. Also, the built-in wheel speed dials makes it easy to adjust the breaking pitch plane. That may not sound like a lot, but if you’ve used a two-wheel pitching machine before you know how difficult it is to change the pitch, switch from left hand to right hand, or change any setting for that matter. That’s the nice thing about the machine because the dials make the process of changing from curveball to fastball quick. As far as variety goes you won’t be lacking in choices either. A hitter has to face different pitches throughout the game, and that’s what you get here. Not only can the machine throw different pitches, but they’re very accurate. The fastball is really a fastball and the curveball behaves as it should. The sliders fly along as expected, and the split fingers behave as if thrown by a real pitcher. If you’re just starting out, you can adjust the dial so it throws pitches slowly, giving you time to get used to the speed, but if you’re a pro, crank it all the way up and you get 100 mph. These speeds are not exaggerated so your bat has to be ready. The Sports Attack does a great job with pitching but that’s not all it can do. It’s more than capable of simulating 380 ft. fly balls so fielders can work on their game, and it’s good for grounders, realistic infield pop-ups, catcher’s pop ups and line drives. In other words this is the complete package, ideal not just for hitters but fielders as well. If you’re not happy with the elevation, change the setting, and unlike those on two-wheel machines, you don’t need to release a locking mechanism. With a two wheel system, not only do you have to release the lock, but you also need to reset the throwing head manually and re-lock it. Needless to say this takes a lot of time and can throw you off rhythm, but with the Hack Attack this won’t be a problem anymore. Watch this video to see all about the drills you can run using the Hack Attack pitching machine. The Hack Attack pitching machine for sale has been in great demand, and it’s easy to see why because feedback has been very positive. Kristie wrote a review of the machine and said it has some of the “best curves” she’s ever seen on a pitching machine. Brett also said the same thing, and added that it’s suitable for hitters with different styles. Response has also been positive from Rex of Oakland, John of Minnesota and Shane of New York, who all said that the machine is as versatile as it is durable. When all the reviews are assessed, the consensus is that it’s as good a pitching machine as any available. Customers also liked the Jugs Lite-Flite pitching machine as well for an alternative. As Hack Attack pitching machine reviews have pointed out, it delivers. It’s not perfect, but it’s pretty close and provides a level of variety that you can’t find anywhere else. Sports Attack has always been known for its quality products, but they’ve really raised the ante with this one. 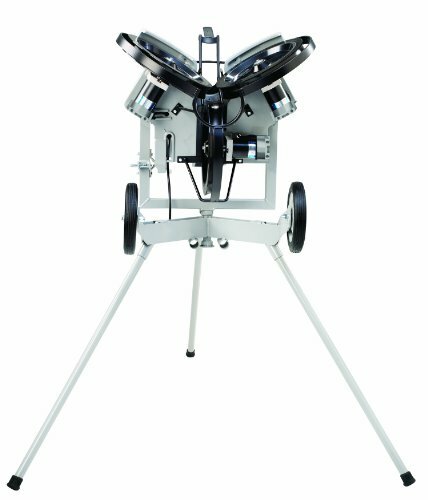 If you’re not satisfied with your hitting, then you may want to give this hack attack baseball pitching machine a shot. Speed Zooka Review – Best Machine For Hitting and Fielding?